Book Five in The Hunt series. This title is FREE to read for Kindle Unlimited subscribers (click the link for a 30-day FREE trial). A new leader. Many old dangers. One true Menace. The dust settles on an election result. A new era beckons. Can anyone stop him now––would they be foolish enough to try? Enter the deadliest sniper in modern Russian history. An IRA monster long thought dead. And three MI6 agents taking matters into their own hands. The Russian President has his fingers everywhere––is any government or agency safe? And what becomes of the ousted President––leave him alone, or make sure he can never return? From the Best-Selling author of seventeen titles, including The Tablet, comes the fifth instalment in his much loved Hunt series. Another excellent chapter in this gripping series. Russia's new president is in place, and it seems the combination of power and position plus ridiculous wealth have made for an unstoppable madman. The guys at MI5 are slowly learning more and more about the Russians from The Hunt, as well as some new surprises along the way. Great characters really make this series, and the plot continues to wind its way through this book, building slowly again towards another dramatic cliff top finish. ★★★★★ Is a Strong President a Good Thing? Wow! Tim Heath pulls off another great book in his ongoing series of The Hunt. In The Menace, we pick up immediately following the victory of Filipov Matvey over Putin to become President of Russia. He is as ruthless as we expected based on what had transpired in the previous books. Our intrepid team at MI6, Anissa, Alex, and Sasha, are fully involved in this story. Their long quest to bring those behind the Games to justice begins to bear fruit, but in ways, we had not expected. Phelan is back and we learn about his dark past. He is one possibility of the title of this book. Many of the oligarchs and the leaders of The Machine are also an integral part of this story. Of course, we are in the middle of a trilogy, so we have another cliffhanger at the end. Surprisingly, I didn’t feel cheated because of what we had already been given. I highly recommend this book as well as all of the previous books in the series. I could barely put it down to get some sleep. Enjoyed book, excellent characters, and plot. I especially enjoyed the assassin in the book and his excellent marksmanship. I also enjoyed how the book picked up, from the last book. Can they get rid of the new Russian president, that has taken over? Or has power, and revenge gone to his head? A must-read book. Tim Heath does not stop surprising me. 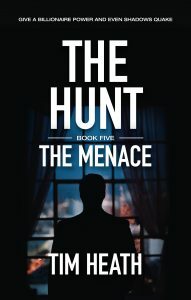 The Menace is one of the best books, from The Hunt series until now. The way the story goes from The Prey to The Pride to The Poison and then to The Machine in order to continue through The Menace… OH! It's getting better and better! What a perfect mixture of sniper's magic, presidential's self-centeredness, agency's HUNTING… Everything is about the hunting… A Game that never ends, but when the hunter becomes the hunted? I can't wait for the next book as the ending was too powerful…. There is a new President in the Kremlin, a group out to get him and MI6 trying to keep up with what is going on. This continues the story that began in The Machine, with characters we have got to know in The Hunt series but with an unexpected backstory for one of them and some new characters too. It ends with a tense standoff. I can't wait for the final book of the series to discover what happens next. ★★★★★ A really brilliant book. Brilliant book couldn't put it down. All the characters from the previous books were there. Can anyone rein in the new president? If you cross him you pay the price. Finishes on a cliffhanger roll on the next book. ★★★★★ Gripping, intriguing and original storyline. Wow, another gripping read. It took me a while to get back into the backstories of all the characters, it's been a while since I read book 4, but the author added enough reminders for folk like me who need reminding what happened in previous books. The plot soon heated up and I am now desperate to read book 6. Very clever web of plots, I'm hooked! Also very current and topical, Lots to think about. ★★★★★ Hang on tight for a breathtaking ride! Each book in this series stands alone in craftsmanship and reader enjoyment; the story continues without a blip and tension mounts once again. It is so very easy for me to become engrossed in one of Tim Heaths’ books that I save them for a special time to read. I have tried to stop reading partway through a book several times but, to my dismay, I pick it up again and read straight through!This book contains a lot of action, a few new characters and repeating ones, as well. Heaths’ writing is, as usual, original and well thought out. When I think of the many facts needed for the background of this book my mind reels. Yet, Heath weaves facts, figures, history, locations and people into a plausible adventure for this reader and off I go into the unimagined world! Not only this series, but the previously written books by Tim Heath, are outstanding in numerous respects. I always look forward to his new offering and this fifth book of THE HUNT series lived up to my expectations. I am hooked on this series. Each book is incredibly well crafted and researched, with great character building. They all make you question today's society on moral values but without being preached too. There is no black and white, only grey and perhaps the lesser evil. It's packed with suspense and finishes once more with a huge cliffhanger. Can't wait to see where the author is going with this. ★★★★★ Do not get on the wrong side of the new president! I enjoyed the book, enjoyed meeting up again with my favourite characters and nice to meet new ones. Tim Heath was very clever adding 2018 landmark happenings in his book which all makes everything seem a lot more real. Look forward to reading the next one. Really enjoyed this book The series continues to reveal what’s next for the characters I’ve got to know so well. can’t wait for the next book in the series.